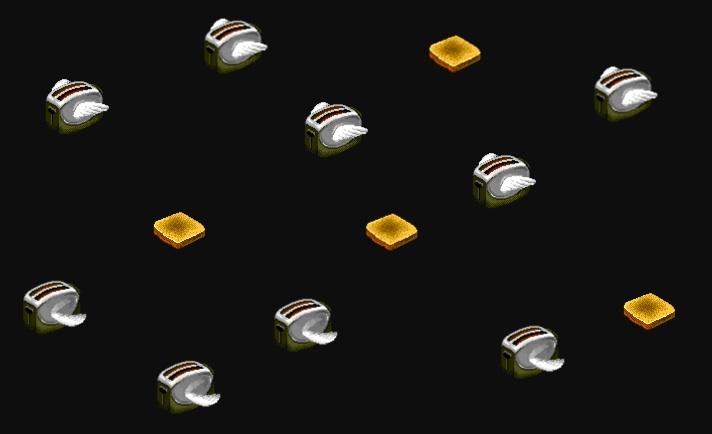 One of my favorite classic screensavers from back in the day was “Flying Toasters,” a part of the After Dark bundle. Ahhh. Those were the good old days. As a front-end developer, I started wondering if you could recreate the magic using only CSS. The answer, as you probably guessed is, yes, you can (you can see it in action here). Here’s how I went about doing it. Getting a character to move isn’t new, and one of the classic techniques is to put together a “sprite sheet,” which is an image that contains all the individual frames of your animation. To give it the appearance of motion, we need to hop rapidly from one frame to another. We do this by creating a box with a fixed width and height and putting in our image as a background image. Now we want to move the position of that background image between each of the sprite frames. We do this by defining some CSS keyframes (you’ll want vendor prefixes on many of these rules for cross-browser compatibility, but for the sake of brevity, I’m leaving them out). * to the right the full length of the image. By themselves, keyframes won’t do anything. You need a CSS rule to call them with the animation property. See the Pen CSS Sprite Demonstration by Bryan Braun (@bryanbraun) on CodePen. With the flapping part done, we just need to move it across the screen. The toasters fly from the top-right to the bottom left, and we could choose to animate this by changing the value of z-index or by using a newer function called translate(). According to the fine folks at HTML5Rocks, animating translate() is more performant than z-index, so we’ll go with that. * Define keyframes to translate it to the bottom left. * than most standard screens. Now we have a single flying toaster. Whoo hoo! But what’s a flying toaster without toast? Animating the toast is easier because it doesn’t need to flap. We just get a single image of toast and move it across the screen. In fact, we can borrow the same position and keyframes we defined for the toaster. * Notice that I added a 6s delay, so it comes after the toaster. As you can see, the code is very similar to that of the toaster. Step 4: More toasters! More toast! With all the hard work done, we just need to throw a whole bunch more toasters and toast in there. We want them to come onto the screen from all different places, so we’ll define several more starting positions (similar to .p1 & .p2). We’ll want a few waves of toasters to keep the screen covered while we wait for the first round to repeat again, so we’ll add more animations (which I’ll call .t1, .t2, etc.) with a starting delay on them. We also want toasters flying at different speeds and ones with wings flapping out of sync with the other toasters. For that, we’ll define even more animations with various adjustments to the properties. Finally we have it: the flying toasters screensaver. I’ve put the source up on Github, if you want to take a look. It’s part of a whole set of After Dark screensavers that I’ve animated with CSS (including Fish, Warp, Rainstorm, Messages, and others). Definitely check them out, if you miss that part of the 90s.